I Love You More Than Carrots: Chef Boy-Are-You-Lazy. Yes. You are looking at my lunch. Not only for today, but for the next three days. 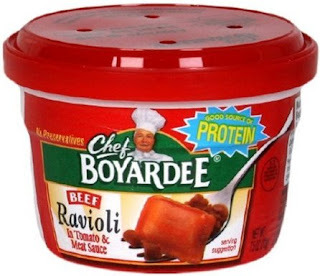 And no, it will not always be "beef ravioli." As a matter of fact, I ate "beefaroni" today. And no, I was never allowed to have these growing up. I'm making up for lost time. Stay tuned for weekend updates, derby hat picks and a very late Flashback Friday. Haha- once or twice a year I buy a can of "spagetti-o's." So gross but I love them in all their canny goodness! Enjoy! I love indulging in (the orange powdered) mac & cheese, since I wasn't allowed to eat it growing up. Wow...my mouth just started watering. hahah - my lunch is lean cuisine and/or canned soup EVERY day. Who has time to make a sandwich? I totally forgot about these!! I used to take them for a quick lunch when I was in school. They were always so good! haha! Easy lunches are the best! I used to keep a stockpile of those in my desk at work in case I had to work through lunch. Let's just say that stockpile was continuously renewed. PS - I was allowed to have these when I was little and I still LONG for hurricanes cause it means we have to buy non-perishable food and these are what I pick for me in case of emergency - and after it's all over, I eat them all anyway! YUM!! !